Associate Justice Elwood G. Lui, as Presiding Justice of the Court of Appeal, Second Appellate District, Division Two (Los Angeles). He will fill the vacancy created by the retirement of Presiding Justice Roger W. Boren. Judge Anne H. Egerton, as Associate Justice of the Court of Appeal, Second Appellate District, Division Three (Los Angeles). She will fill the vacancy created by the retirement of Justice Patti S. Kitching. Judge Patricia Guerrero, as Associate Justice of the Court of Appeal, Fourth Appellate District, Division One (San Diego). She will fill the vacancy created by the death of Justice Alex C. McDonald. 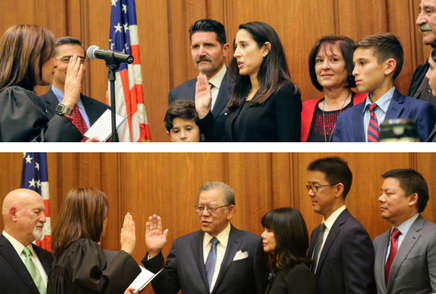 The appointments were approved by a unanimous vote at the public hearings held today in the Supreme Court Courtroom, 350 McAllister Street, San Francisco. Photos of the Commission hearings can be downloaded here. Justice Lui would fill the vacancy created by the retirement of Presiding Justice Roger W. Boren. Lui has served as an associate justice at the Second District Court of Appeal since 2015. He was of counsel at Jones Day from 2014 to 2015, where he was a partner from 1987 to 2013. Lui previously served as an associate justice at the Second District Court of Appeal (1981-1987) and judge at the Los Angeles County Superior Court (1980-1981) and the Los Angeles County Municipal Court (1975-1980). He was a sole practitioner in 1975, an attorney at Mori and Katayama (1971-1975) and a deputy attorney general at the California Department of Justice, Office of the Attorney General (1969-1971). Lui earned a Master of Business Administration degree from the University of California, Los Angeles Graduate School of Business Administration, a Juris Doctor degree from the University of California, Los Angeles School of Law and a Bachelor of Science degree from the University of California, Los Angeles. Judge Egerton would fill the vacancy created by the retirement of Justice Patti S. Kitching. Egerton has served as a judge at the Los Angeles County Superior Court since 2001. She was a senior vice president at the National Broadcasting Company Inc. (1990-2000), and a partner at Munger, Tolles and Olson LLP (1987-1990), where she was an associate (1983-1986). Egerton was an associate at Wilmer, Cutler and Pickering (1981-1982) and served as a law clerk for the Honorable John H. Pratt at the U.S. District Court, District of Columbia (1980-1981). She earned a Juris Doctor degree from the University of California, Berkeley School of Law and a Bachelor of Arts degree from Occidental College. Judge Guerrero would fill the vacancy created by the death of Justice Alex C. McDonald. Guerrero has served as a supervising judge for the Family Law Division at the San Diego County Superior Court since 2017, where she has served as a judge since 2013. She was a partner at Latham and Watkins LLP (2007-2013), where she was an associate (2003-2006 and 1997-2002). Guerrero served as an Assistant U.S. Attorney at the U.S. Attorney’s Office, Southern District of California from 2002 to 2003. She earned a Juris Doctor degree from Stanford Law School and a Bachelor of Arts degree from the University of California, Berkeley.